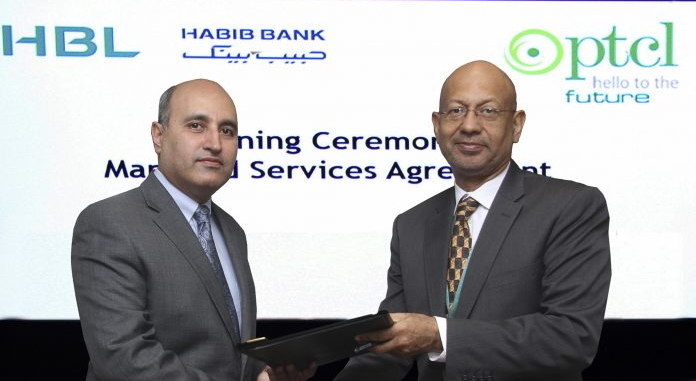 PTCL, the largest telecommunication service provider in the region has inked a comprehensive Managed Services Network Agreement with HBL, the largest private sector Bank in Pakistan, for connectivity of Branches & ATMs network across Pakistan for a term of three years. This initiative, offered by PTCL, will be deployed on multiple numbers of branches & ATMs with data connectivity, IT equipment and associated maintenance, providing ease and hassle free services for HBL. The agreement signing ceremony was held at HBL Head Office, I. I. Chundrigar Road, Karachi. This technological partnership will enable HBL to focus on its core business functions resulting in supreme customer services with the help of PTCL being responsible for providing connectivity services in the field network. Kamal Ahmed, Chief Digital Services Officer-PTCL, said, “PTCL’s customer-centric strategy coupled with its modern and reliable network is the only choice for enterprises to avail one window ICT solutions. As the national telecommunication services provider, we are providing services of international standards to the entire business segment in Pakistan ranging from large enterprises to SME customers.